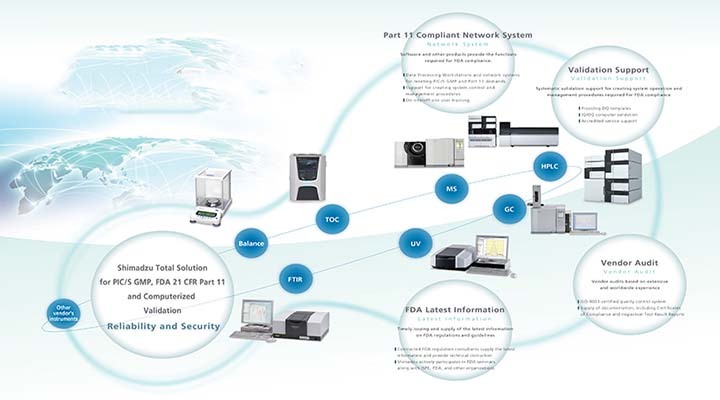 All Shimadzu network system products incorporate functions for the PIC/S GMP and the Part 11 compliance regulation, and computerized validation functions required by GxP. Shimadzu provides documentation including IQ/OQ, Certificates of Compliance and Test Result Reports based on Shimadzu ISO9001 certified system. Shimadzu’s accredited service personnel offer full support for validation of customer’s Shimadzu products. In addition, Shimadzu provides comprehensive customer support for PIC/S and FDA compliance, including supplying the latest information on PIC/S and FDA regulations through seminars and workshops, participating in vendor audits demanded by agencies and actively assisting customers to comply with new regulations. "Multi Data Report" registers pre-created templates to a database. When a report is generated, it automatically selects the template, pulls required data from the database and conducts the calculations. Through this procedure, only templates and data already in the database are used for calculations.The report that calculated the results is also saved and managed in the database. Consequently, the user does not directly touch the data, thereby maintaining the access control, audit trail, and protection and security of data. Shimadzu can provide documents for validation plans, required specifications, functional specifications, supplier check list, etc. for regulatory compliance. IQOQ is performed by field engineers certified by Shimadzu Corporation to ensure secure inspection. A standardized inspection protocol allows engineers to effectively perform an IQOQ in a short time. This service reduces space for storage of documents and improves visibility of inspection results. Currently this service supports HPLC, UV and TOC. Other instruments will be supported sequentially. Customers are provided with a summary report of installation information recorded for IQ, such as the serial and model numbers of instruments included in the IQ process, as well as setting values, control criteria, and pass/fail results for each OQ inspection parameter. This summary report helps ensure that customers can confirm inspection results and the regulatory authority can audit efficiently.